Be the first to share your favorite memory, photo or story of Willa. This memorial page is dedicated for family, friends and future generations to celebrate the life of their loved one. 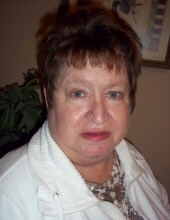 Willa Dean Holbrook, age 65, passed away at her home with her family on Saturday December 15, 2018. She was born on April 26, 1953 in Rosiclare, Il to Edgar T. And Mary Loudean Gallamore. On June 15, 1979 she married Gaylord Holbrook. They had three children. Willa loved Pope County and lived in Golconda her entire life. She always said to her "there was no other place she would rather live." Willa was a stay at home mother and enjoyed anytime she got to spend with her family. She baby sat several children from the community over the years and always helped anyone she could in any way she could. Willa loved to cook, dance, sing, be silly and take care of her family and friends. Her smile and caring personality will be greatly missed. Willa is survived by her loving husband Gaylord Holbrook, daughters Angela (Jonathan) Shaw of Eldorado, Gayla Holbrook, Eldorado and son Christopher Holbrook of Golconda. One grandson Brandon Saul's, Eldorado. Loving sisters Varnell (James) Cummins, Harrisburg, Louella (Steve) King, Centralia, Frances (Ernest) Ramsey, Golconda, Cathy (Melvin) Reynolds, Brookport, Loving brother Billy(Christy) Gallamore, Golconda and Ricky Gallamore of Florida, several cousins, neices, nephews and friends and her special lil Sweat Pea, Mason Ramsey. Funeral service will be 1:00 pm on Tuesday, December 18, 2018 at the Social Brethren Church in Golconda. The service will be conducted by Bro. Roy Baker. Burial will follow the service at the IOOF Cemetery in Golconda. Visitation will be from 11:00 AM until time of service on Tuesday at the church. To send flowers or a remembrance gift to the family of Willa Holbrook, please visit our Tribute Store. "Email Address" would like to share the life celebration of Willa Holbrook. Click on the "link" to go to share a favorite memory or leave a condolence message for the family.